April was a very busy month for me. Between going to Denver for my badge, the Cannabis Cup, and a courier job, I haven’t had any time to do any reviews, but everything is back to normal for now and I’m ready to write! Today, we’ll be checking out the D-Nail Digital Essential Oil Vaporizer. 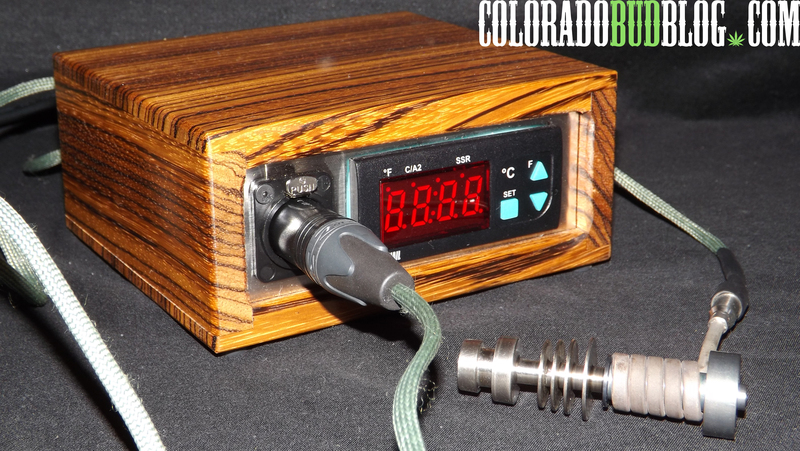 The D-Nail Digital Essential Oil Vaporizer is used for vaporizing Cannabis concentrates (taking dabs). 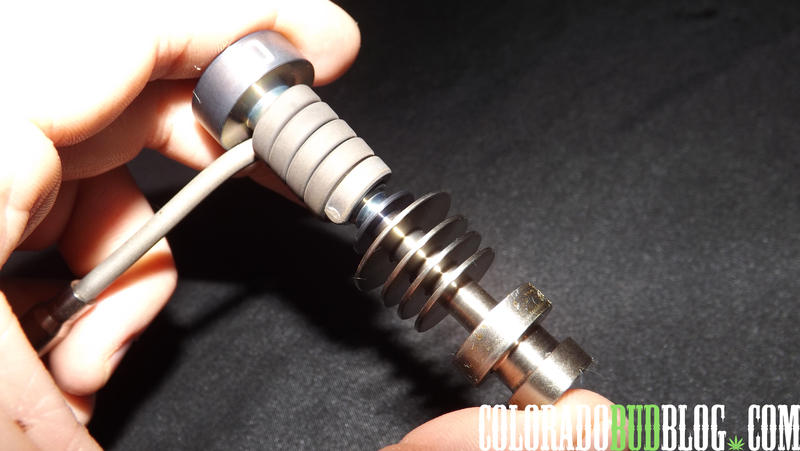 It is basically a domeless nail that always stays hot. You can adjust it to any temperature up to 1112 degrees (F), although it is NOT RECOMMENDED to set it above 1100 degrees (F). It heats up very fast, reaching over 800 degrees (F) in under 3 minutes! It’s great to just come home from work, turn on the unit, and have a heated nail, ready to go for the rest of the night. 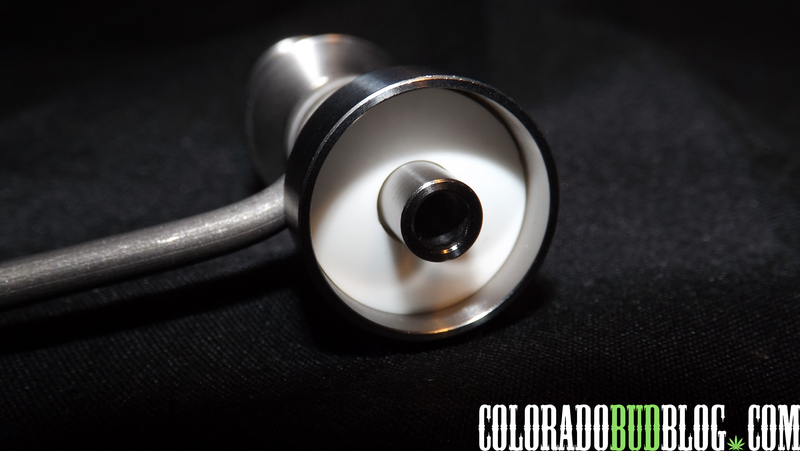 The standard D-Nail features a domeless nail with a 14/18mm MALE joint with a heater coil wrapped around it that heats up. 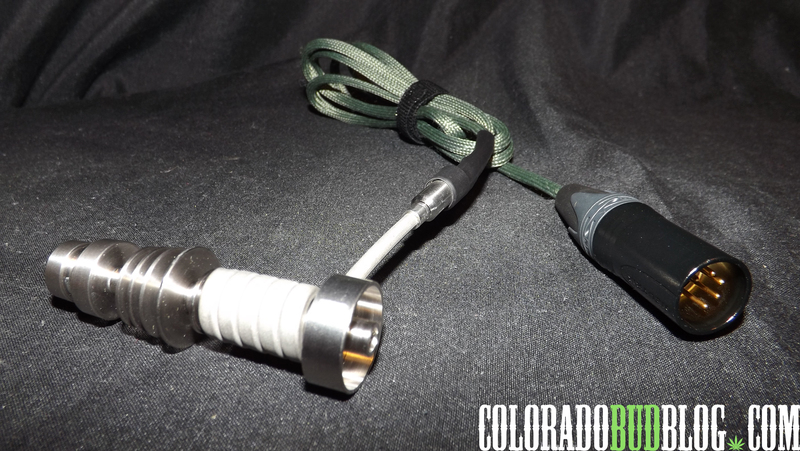 Since it is a male joint, I had to buy an adapter for it so it would fit on to my oil rig, which I didn’t like very much at all because I had to drive an hour to get to the nearest glass shop to find an adapter. I hope they change their standard nail to one with a female joint. Standard 14/18mm Male joint D-Nail. 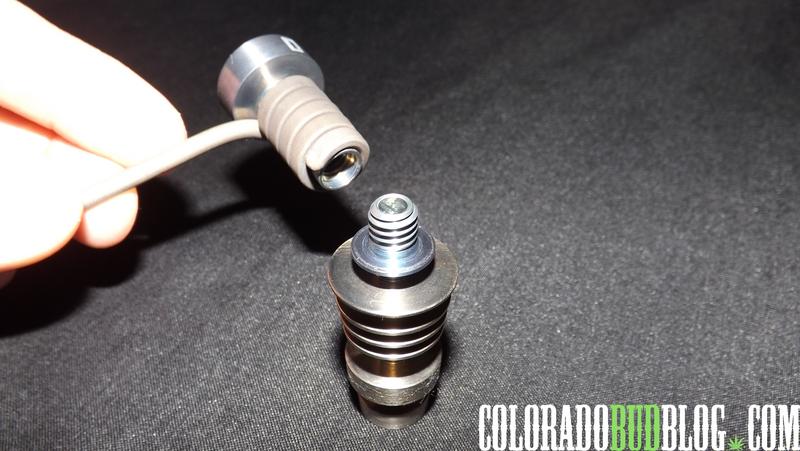 The nail is threaded and breaks down in to 2-pieces so you slide the coil in to position. 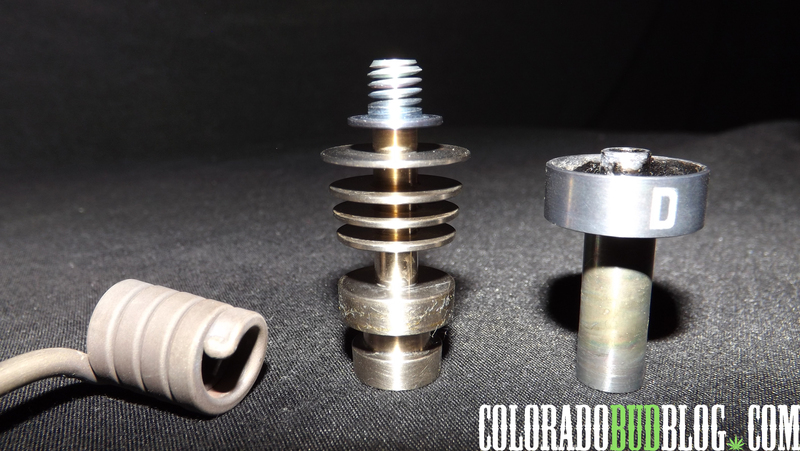 The coil, the bottom joint part of the nail, and the domeless nail top. The nail even comes with a ceramic disk insert. 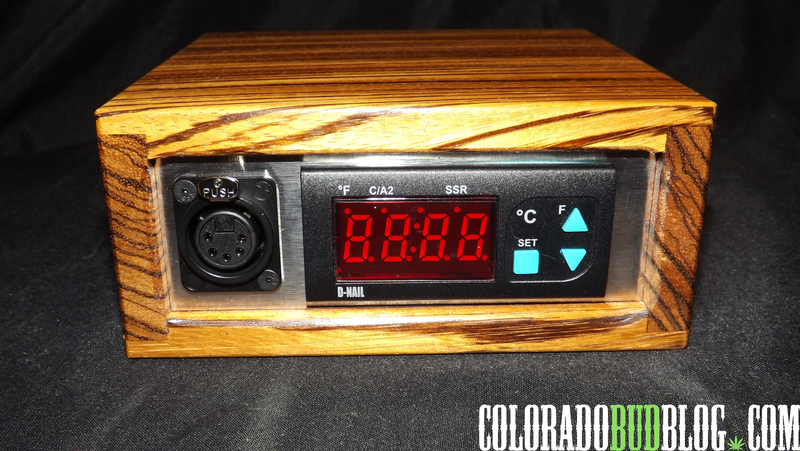 The front of the unit has a digital readout and buttons to adjust the temperature of the nail. You simply push the set button, adjust the temperature using the up and down buttons, and the unit will begin to heat up. 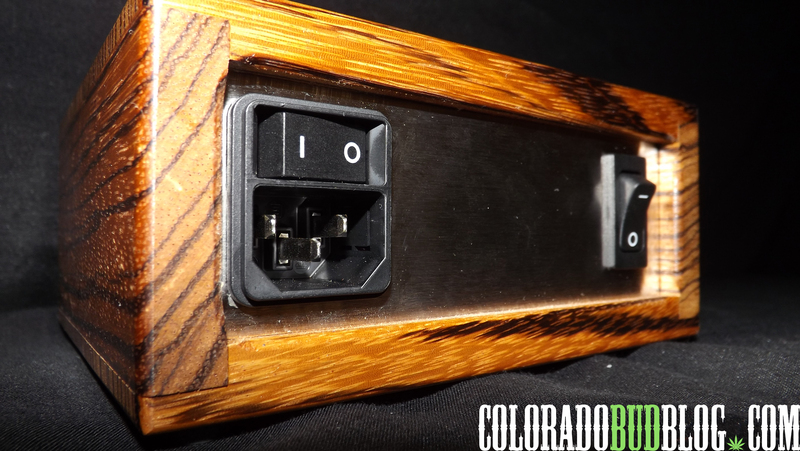 The back of the unit has a socket for the power cord, and 2 power switches. The one on the left turns the unit on, while the switch on the right turns on the heater. You will need to flip both switches on in order for the unit to work. When you are done using your D-Nail, you can turn the heater off first and watch the nail cool down, which is great because you can make sure it is completely cooled off before you touch it. 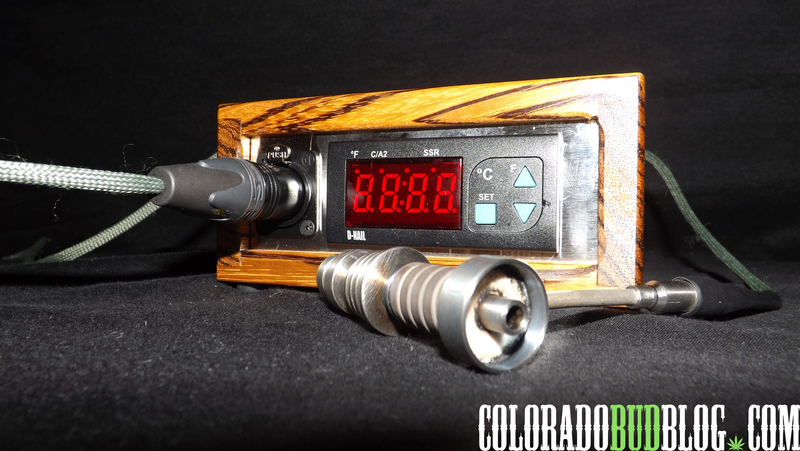 This particular D-Nail comes in a beautiful Zebra wood box. It is sturdy and just plain awesome looking sitting on the coffee table. The Zebra wood box costs more than the other colors, but this is by far the best looking one. I would highly recommend using the D-Nail with a large rig. 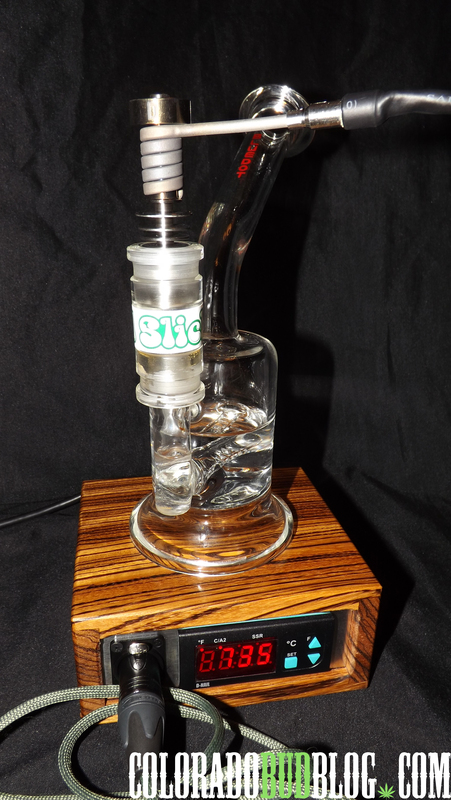 If you use it with a small rig, the rig will becomes too top heavy and will easily fall over. Since the D-Nailis always hot, it works great for low temperature dabs, which gives you a better tasting hit. Aside from the fact that the standard nail that comes with the D-Nail has a male joint, this product works very well. It heats up to over 800 degrees (F) in under 3 minutes, it has a 5 foot cord for the heater coil so you can easily pass it around the living room or dining room table. 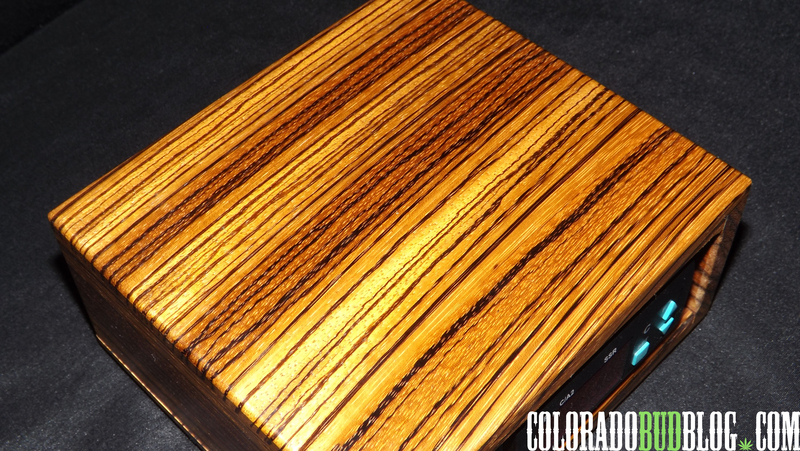 The Zebra wood box is awesome, but it does come in other colors for someone who wants something different. The warranty that comes with the D-Nail is pretty legit: “a free, no questions asked replacement heater, and all other parts are warrantied for 3 years against failure. Repair after the warranty or from accidental damage can be done at a fair price“. The heater will eventually fail, but with proper use they will last a long time before they go out. With that being said, the D-Nail Digital Essential Oil Vaporizer was a great buy. It works great for low temperature dabs, and for vaporizing solventless full melt ice water hash. I would recommend this to the more serious dabbers that require a nail that is always ready to go. For info and to order your own D-Nail Digital Essential Oil Vaporizer, visit http://www.d-nail.com!